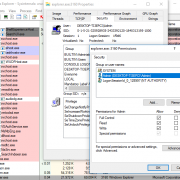 McAfee File Lock Driver does not handle correctly IOCTL_DISK_VERIFY IOCTL requests, which leads to kernel memory leak through specifically crafted IOCTLs. Normally the IOCTL_DISK_VERIFY IOCTL is used to verify an extent on a fixed disk and doesn’t return any data. The kernel memory leak is generated by the fact that the McPvDrv.sys driver doesn’t validate the VERIFY_INFORMATION.Length which is controlled by our input buffer. Furthermore, the driver trusts that value as the size of the input buffer allocated in kernel space, causing the associated function to read data passed the size of the speficied input buffer and read arbitrary data from kernel address space back to userland into a specified output buffer.